Trunk of Scrolls is so full of history, it COULD HAVE been true! When scheduling your year of Church Fathers to the Reformation, perhaps with Veritas Press Omnibus II, you can fit Trunk of Scrolls easily into the plan. According to the Veritas Scale*, Trunk of Scrolls would probably rank 343 or 442 (Theology, History, Literature; total 10 points). If you are willing to incorporate Trunk of Scrolls into your Omnibus Curriculum, download the FREE Study Guide. Purchase the paperback and ebook through the Publisher or the Kindle on Amazon. Download the FREE Study Guide Today! 5. The best tie-in is during or after studying The Church History by Eusebius, and concurrent with the Confessions and Creeds. 6. All that is needed is the student. The novel can be used as a stand-alone almost “time-travel” experience of the Early Church era, but also can be used in tandem with other Church History materials. Get started today! In the context of their struggle for survival in a harsh world, the TRUNK OF SCROLLS characters wrangle with the role of God in that tragedy. The novel leaves readers with a lingering question: In my own challenges, am I neglecting the Bible I am so lucky to have? The Historical tie-ins are evident in the Study Guide, but also through the Facts of the Matter pages on this website. Also available: Free TIMELINE of historical and fictional elements in Trunk of Scrolls (includes spoilers, beware). 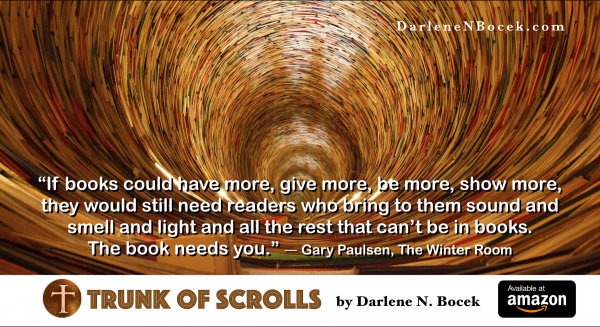 Trunk of Scrolls is the quintessential in historical fiction. It is so full of history, it COULD HAVE been true! Facing wild animals, wild men, and a wild God they do not understand, crossing paths with Chrysostom, Simeon the Stylite, John of Ephesus, Belisarius, Emperor Justinian and even Saint Emmelia, the family has to choose between humanity and honor, wealth and faith, yesterday and tomorrow. It takes sixteen-year-old Marcellus, a patrician’s son of Antioch, and walks with him through the next six years of his life as he sees wickedness of man and the wickedness of the world. His life encompasses the Big Questions of God’s role in private pain and corporate suffering: assault, abduction, robbery, conspiracy, sickness, death. But it is also a coming-of-age story about Marcellus becoming a man with increasing responsibility in his family, city and world while trying to understand his blossoming love of kinswoman Byziana. 526 AD. Antioch lies in ruins. Once the glory of the Roman empire, where Christianity came to its own, the city is now is a broken-backed man that cannot stand. Sixteen year old Marcellus, a young Byzantine nobleman, is forced to rescue his neighbor Byziana and her young siblings from their home in Antioch rushing them to the capital city of Constantinople. Trekking through seven hundred miles of bandit country they hope to find their missing father and recover their lost fortune. Three things can determine their future: a betrothal ring, a tooth of an infant saint, and a trunkful of forbidden Scripture scrolls. One brings horror, one brings despair and one brings hope. But which is which?